He also outlined his priorities, including a balanced budget, immigration reform and states’ rights. Utah Gov. Gary Herbert and others cheered him on at a packed victory party. U.S. House Speaker Paul Ryan, Romney’s 2012 running mate, tweeted his congratulations. Romney denounced Trump as a “fraud” and a “phony” during the 2016 campaign, but has since changed his tone, saying he approves of many Trump policies and predicting he will win another term. Trump, for his part, has endorsed Romney’s Senate run. 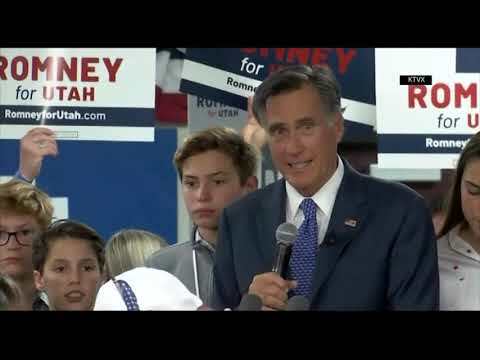 Romney, 71, moved after his failed 2012 presidential run to Utah, where he’s also known for running the 2002 Winter Olympics in Salt Lake City. His past criticism of Trump wasn’t a serious liability in Utah, where many voters are wary of the president. The former Massachusetts governor argued during the Utah campaign that his political profile would be a boon to Utah’s standing in Washington. In a concession speech, she said she wanted to speak for people who felt left behind by Utah’s all-Republican delegation. “I am in it until the Trump rallies of division and hate are a thing of the past,” Wilson said.